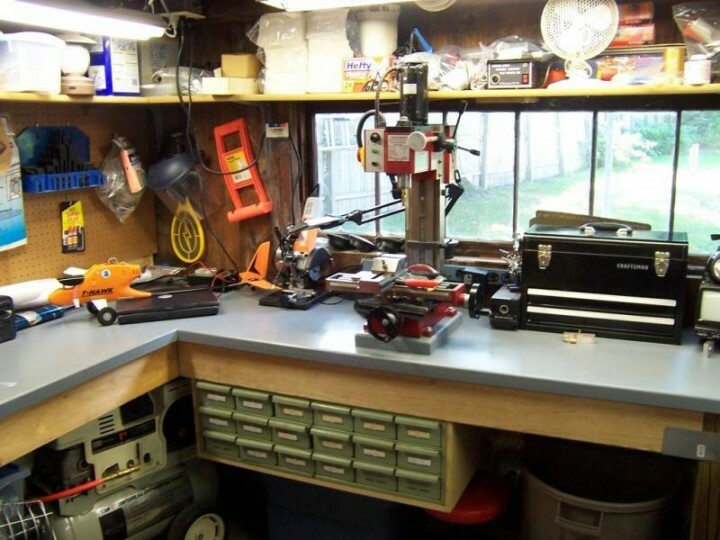 This article describes how I make workbench tops using particle board. I’ve been using this method for about 20 years with good results. Although the next time I build a similar bench I may use a laminate counter top for two reasons, which I’ll explain later. I don’t like benches that move, shake or vibrate. I think the heavier the frame and top are the more stable a workbench will be and the better it will dampen vibrations. Particle board is very heavy which is why I like to use it. To make it even heavier and stiffer I glue two 3/4-inch layers together. Particle board is also very dense, unlike plywood and MDF, which means it won’t dent very easily or much if you hit it with a hammer or drop something heavy on it. It’s also inexpensive and it won’t warp. I’ve tried using plywood but it dented and splintered easily. Wood planks will do the same. Plus planks can warp and it’s not easy to build a smooth seamless work surface out of them. I built the L-shaped bench shown in the picture a couple of years ago. The frame was built with 2x6s instead of 2x4s to make it strong enough so I could eliminate all but two legs and keep the space under the bench unobstructed for storage. The legs are at the ends and are made from pressure treated 4x4s. I began construction by screwing the back rails to the wall studs. I made certain they were level and used screws that could support a lot of weight. Then the front rails, side rails, legs and cross braces were added. I used metal joist hangers, angle brackets and deck hardware to fasten them all together. They added to the cost but I think they made the bench much stronger and quicker to build. You might want to bring some help with you when buy the particle board because 4×8- foot sheets are heavy. I got Home Depot to rip them in half lengthwise. It saved me a lot of work and made the boards easier to handle to bring home. If you have them do it make certain they measure correctly. The first sheet they cut was off by 3/4-inch and I wouldn’t accept it. They very graciously cut another. This L-shaped bench top was harder and more complicated to make than a simple rectangular one. I began by fitting the lower-layer pieces against the walls. Then I cut and glued just one of the top pieces so it overlapped the seam in the bottom layer. When the glue was dry I fitted and glued the remaining piece, making certain that it butted very tightly against the other one. I also made certain it was well clamped and weighted down while the glue dried. I ended up with a very tight seam that only needed a little bit of wood putty to make it disappear completely. It’s still invisible two years later. I used the “original” Gorilla Glue to glue the particle boards together. There might be cheaper alternatives but I wasn’t going to take any chances on the seam between the two layers coming apart. This kind of Gorilla Glue is water activated and you’ll need to use a spray bottle or wet rag to slightly dampen the surfaces just before you apply it. I used a plastic spreader to spread it out evenly. Then I used lots of clamps along the edges to make certain I got a good bond with no gaps. I also stacked as many heavy objects as I could on the rest of the bench to weigh it down. It’s not likely that you are going to get both layers of particle board cut and lined up so the edges are perfectly even. So after all the glue was dry I used a router with a flush cut bit to make them even. This may require positioning your router on both sides of the bench top. I couldn’t do that because there wasn’t room to flip my L-shaped top upside down, and the support frame prevented me from holding the router upside down against the edge. So I had to plan ahead and make certain that the top layer extended beyond the bottom one a little bit so the router bit could trim it flush. I then used the router with a 1/2-inch round-over bit to round the edges of the workbench. It’s a little bit more work, but I think it makes the bench top look more finished and professional looking and it makes the edges more comfortable to lean against. Rounded edges also won’t dent or splinter like sharp ones will if they get bumped with something heavy or sharp. They’re not hard to make but I recommend practicing on scrap first. I haven’t tried it yet but I’ve heard that some people like to cover their bench tops with hardboard. It’s a cheap, durable, and easy-to-replace surface that doesn’t need to be painted or finished to look good. I considered using it but decided to paint the top, as I have in the past. It didn’t take much work to get a smooth painted finish because the particle board I bought came from the factory with top and bottom surfaces that were almost as smooth as glass. But the edges had small voids that needed to be filled with wood putty and sanded smooth. I then applied a couple of coats of sanding sealer to the entire top. The final step was to paint it with latex enamel. I choose a light gray color and applied two coats with a brush, lightly sanding after the first coat to minimize brush marks. Cost is the primary reason why I didn’t a use a laminate counter top for this bench. Since then I’ve discovered that the “Mr. Seconds” store near me has a good selection at affordable prices. So I”ll probably buy one for my next bench, which I”ll be building soon. Although, I will be putting another piece of particle board underneath it to make it stronger and heavier. Latex enamel is another reason why I’ll probably use a laminated top the next time. I had to use latex because apparently you can’t buy oil-based enamel anymore, at least not in New York state, because of air quality regulations. Latex just doesn’t seem to produce a finish that’s as hard and durable. It still felt tacky after more than a year. Please tell me if you know of a better alternative. The next bench is also probably going to have a welded steel square-tube frame. I don’t think it’s going cost much more and I can make a strong frame that is much thinner than a wooden one. That’s important because because I want to have enough height underneath it for some roll-around tool chests. I have a lot of shelves in my workshop but not enough drawers.